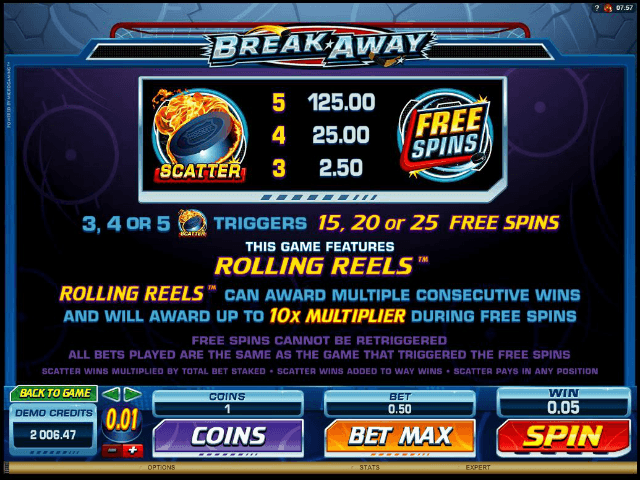 Break away from the daily grind and spin up a storm on Microgaming’s Break Away slot. This game is set around ice hockey, although you shouldn’t be put off if you’re not an ice hockey fan – this online video slot has plenty to offer. It’s played on five reels and offers 243 ways to win, with slick graphics, exciting background audio and excellent win potential. There are Stacked Wilds, Free Spins and a rewarding Smashing Wilds feature. 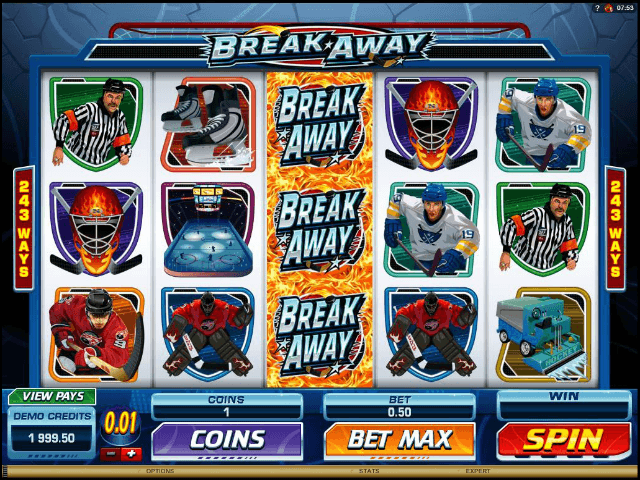 Get to know the breakdown of this game with this Break Away slot guide! The Break Away game from Microgaming has a very decent 96.42% return to player. There’s lots to enjoy in this smashing slot. Cascading reels in the base game have the symbols shatter in an explosion of ice, while more symbols fall onto the reels offering you a mini Free Spin. If you like your slots play intense then put on your hockey mask, arm yourself with your stick and skate on over to a Break Away casino – payouts come fast and furious with Stacked Wilds, Rolling Reels, Scatters, Multipliers and Free Spins. This game can be played from 50p a spin and has a 125,000-coin jackpot on the reels, so be sure to get your skates on. 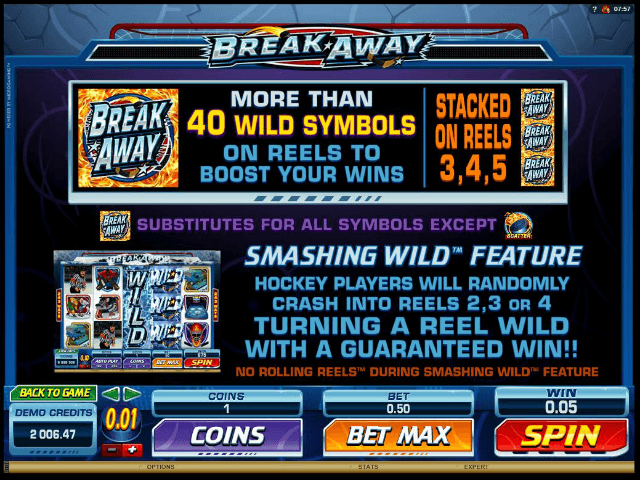 The action comes from the long tails of Stacked Wilds in the Break Away video slot. There are a mammoth 40 Wild symbols stacked on the third, fourth and fifth reels and they substitute for all other symbols in the game, except the Scatters. There are two special symbols to look out for in this game: the fiery puck is the Scatter and the Break Away icon is the Wild symbol. Hit 3 Scatters to trigger the Free Spins. The Scatter is definitely the most rewarding symbol – this is where the huge 125,000 coin prize can be claimed. Other high paying symbols include hockey players, ice skates, a hockey rink, hockey sticks and hockey masks. 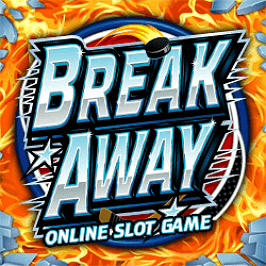 There’s no shortage of wins to smash and crash through in Microgaming’s Break Away. The Random Smashing Wilds feature comes with guaranteed wins and can crop up at any spin. Here the middle reels can produce Expanding Wilds if you hit the right symbols. Slide on over and hit up multiple wins in the Rolling Reels feature. The Rolling Reels game is a very exciting element that’s active during standard play as well as bonus rounds. When the wins come in, the symbols shatter and more symbols drop onto the reels. This feature has plenty of win potential. You can score your way to 25 Free Spins with a 10x Multiplier when you land the Flaming Puck symbols. Three Scatters gets you 15 Free Spins, four Scatters gets you 20 Free Spins and five Scatters gets you the full haul with 25 Free Spins. The Free Spins can’t be retriggered but they all come with Multipliers: the more Scatters you hit, the higher the Multipliers. If you like Break Away - You'll like these slots too!